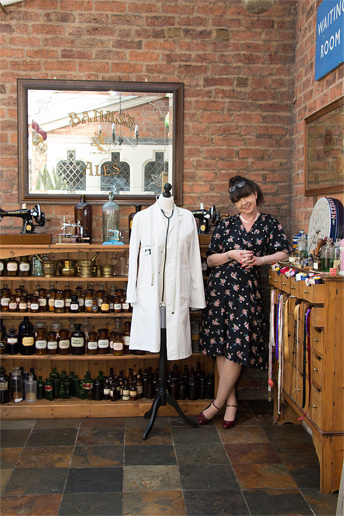 My name is Jane, and I established The Sewing Lab after leaving a 20 year career in science. Hence, the name of the company is a nod to my science background. There isn’t a time that I cannot remember sewing, or watching a member of my family stitching something. On my fifth birthday I was given my first sewing kit, a home-made wallpaper covered cardboard box put together by my mother, filled with all of the sewing essentials that I used to make clothes for my dolls and teddies. Not long after this I was given what is now known as sewing machine No 1. for a Christmas present, a beautiful Singer hand cranked sewing machine made in 1886, which quite rightly sits very proudly amongst even my most modern computerised embroidery machines, and is still in perfect working order. I am now up to sewing machine 49, but I am being constantly urged to divest myself of some of them by my husband, so we now refurbish and sell new & vintage sewing machines, please contact us for details of what we have for sale ~ or just help in chooing the right machine.to purchase for your projects. A science background has provided the perfect training for sewing, such as the ability to construct an accurately mitre angled corner, fabric calculations, working out pattern matching ~ and of course attention to detail. I will most probably be your first point of contact if you call or e-mail us, but we have an ever expanding list of regular tutors, and guest tutors who join us to teach specific courses. Please contact us if you cannot see the classes that you want - and we will help you. We are pleased to announce that we are working with Leonard Cheshire Disability teaching sewing to a small group using the vintage hand crank machines ~ it is so fullfilling to see these beautiful old machines being repurposed for those that are unable to use the more modern electric pedal machines ~ I can't wait to show you the pictures !! The Sewing Lab workshop is based in a purpose built workshop in the beautiful Shropshire countryside.